This is artwork which appears on both sides of a Sholes and Glidden I photographed at Museum Victoria's Scienceworks in Melbourne in February. If anyone knows what it represents, if it represents anything at all or is just meant to look pretty, please let me know. 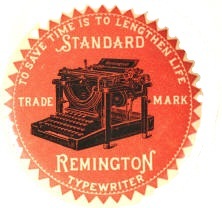 Here is the familiar Remington "star" and distinctive brand name. And something similar from Smith Premier. I am very fond of the Underwood crest. Such a shame that it became something not so distinctive under Olivetti's ownership (compare with the e.e.cumings "mod" all-lower-case Olivetti brand name). And also the US Oliver "Officer Printype". 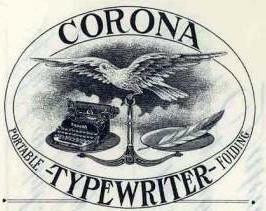 Corona, as Rob pointed out, was very "arty". Here is the Empire Aristocrat lion to which Rob refers. Royal started out looking great, but, as with Underwood and Olivetti, the Royal logo became something else under Litton Industries. This crest appeared on a Hermes portable ("Ch" representing Switzerland = officially the Swiss Confederation; Latin: Confoederatio Helvetica). 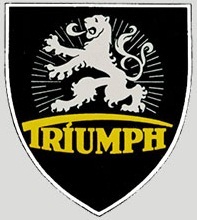 Below is a small selection of some others which are all pretty much self-explanatory (but, with the exception of Triumph's rampant lion, make Rob's point about names only). Nice to see these logos all together. I think the Sholes & Glidden decal you saw represents the American flag in a formal, crest-like way. Every decorated S&G I've seen has different details, and often completely different decals. Each one is a unique work of decorative art. I show a close-up of the Oliver herald or courier here. Thanks, Richard. 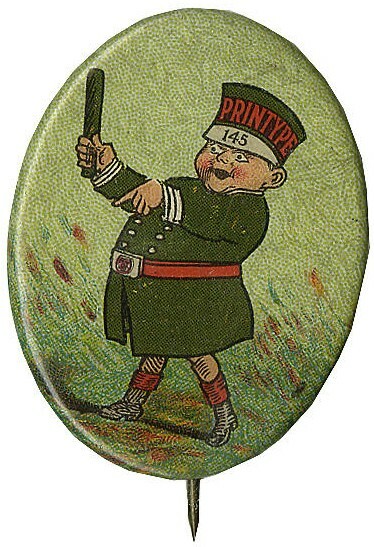 I knew I'd recently seen a good scan of the Oliver herald somewhere, I just temporarily forgot where. Much appreciated.